I first made this stew a week ago, when I was looking for something to do with the small Thai Eggplants that were going to waste in my refrigerator. Aromatic and warmly spiced, this Iraqi stew was so delectable that I was actually happy that I was going to have to make the whole meal again. You see, I had timing issues. I expected the yellow split peas that had been aging in my freezer for, well, ages to behave like fresher peas, and as a result, the stew I imagined taking two hours to cook took over three. And because I had thrown in the eggplant during hour one, it had completely dissolved and become unrecognizable by the time we ate the stew. It was still delicious, and to be honest, disintegrated eggplant is a plus when you’re feeding an eggplant-hating child (in other words, she didn’t know it was there.) But I wanted to get the timing right and perhaps have tender cubes of eggplant, so less than a week later, I was back in the kitchen making this dish again. You’ll notice when you read the instructions that I don’t give a specific cooking time for the split peas; that’s because the cooking time varies depending on how old your split peas are, the hardness of your water, and (I think, though I have no proof of this) your elevation. The peas need to be falling-apart soft before you add the other ingredients because they form a sauce around the eggplant and seitan. If your peas are as old as mine, you just need to cook the heck out of them first. I used a pressure cooker, so my second go-round with this recipe took a lot less time. While I was redoing the recipe, I also decided to tinker with the seitan that goes into it. Previously, I had baked the seitan before tossing it into the stew. This time around, I tried adding the seitan raw to save a step and to see what the resulting texture would be. I’m happy to report that cooking the seitan in the stew worked beautifully; it became more tender and “meaty” than the pre-baked seitan. Which way is better is a matter of taste: I liked the tenderness of the unbaked seitan, while my husband slightly preferred the chewiness of the baked. I’ll leave the choice up to you. And while I’m talking about seitan, I apologize to my gluten-free readers. I think you still may be able to enjoy this stew with, perhaps, chickpeas or another bean standing in for the seitan. Or maybe you can add an extra half cup of split peas and cook them just until al dente before adding the eggplant. If you try it, please let me know your results. I know the recipe seems like a lot of work, but I think it is worth it for this unusual and delicious dish. If you really want to cut time, though, consider using a pound of packaged seitan instead of homemade. The seasoning in this dish is inspired by Baharat, a spice blend used in the Middle East. You may be able to buy jars of Baharat in Middle Eastern grocery stores; to substitute it for the seasonings in this recipe, start with 2 teaspoons and add it to taste, but be aware that packaged Baharat may be spicier than my seasoning mix. Add the split peas, water, dried chilies, and seasoning blend. Cover and cook until split peas are dissolving. How long this takes will depend on the age of your split peas but allow at least an hour for regular stove-top cooking. (The peas I used were older, so I used the pressure cooker and cooked at high pressure for 16 minutes then quick-released.) Once cooked, split peas should still be very watery, not thick like soup. Add water as necessary to prevent drying out. While the split-peas cook, prepare the seitan. Mix the dry ingredients together and add the cold water and tahini (or other nut butter). Mix well. Turn out on a board and knead several times. Flatten out the dough, and using a sharp knife, cut it into rough 1/2-3/4 inch cubes. Set cubes aside. Trim the eggplant and cut it into 1/2-inch pieces. Remove the chile peppers and serve in bowls with rice or pita bread. Cooking the gluten in the stew results in a tender seitan. 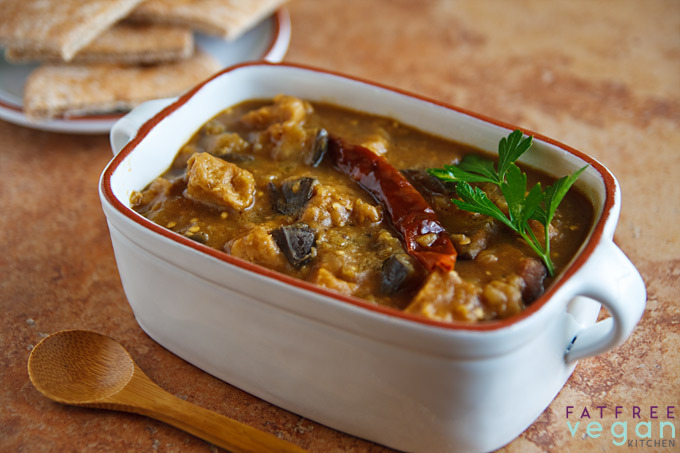 If you’d like a firmer, more chewy seitan, flatten your gluten and bake it at 400F for 20 minutes before cutting into cubes; add it to the stew with the eggplant. Pre-baked seitan will be spongier and look less like m*e*a*t.
I just made it and served it with basmati rice: delicious! 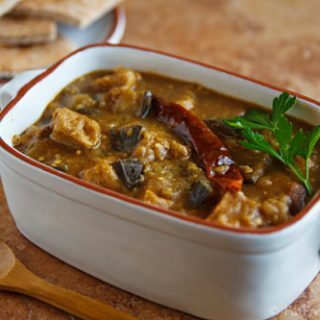 This recipe has now become a favourite of mine and so I have been searching for similar ones: I have found many recipes for persian stews (such as http://turmericsaffron.blogspot.com/2010/03/khoresh-ghaymeh-traditional-iranian.html ) calling for some meat. Do you think I could substitute pre-made seitan? And what amount should I use? I think you could use pre-made seitan in any amount up to the amount of meat called for in the recipe. In a recipe like the one you mention, you should also use vegetable broth instead of water to replace the flavor the meat would have given. OMG…this is insane. the most flavorful dish I think I have ever made. It will be a staple. I shared with my Vegan friends and they all agree. So delish. Looks complicated, but not at all, and making the seitan was key! I can’t wait to try this – haven’t seen it on your site before. YUM!!! Do you think this will do well in a crock pot? I haven’t tried it, but I think it would. I would probably cook everything except the eggplant all together and then add the eggplant later, if possible. Or put it all in at once and see what happens! 🙂 If you try, could you please leave a comment telling what happened? I’d love to know and it may help future readers. I have no knowledge of Seitan but do you think a firm tofu, tempeh or even paneer might stand in as a suitable substitute? The dish looks amazing so would like to try it. I think both tofu and tempeh would be good, but it’s been a lifetime since I had paneer, so I don’t know how it would turn out. I would think the chewier texture of tempeh would be the best substitute. I went to bed late last night so I decided to make this in my crock pot to cook throughout the night. I woke up to a wonderful aroma and a delicious pot of stew. One thing though is that the split peas are al dente’. But that’s okay, I don’t mind. I’m guessing it’s because of their age. I don’t cook with them that often. I used eggplant from my garden and wow, what a difference from store bought. I didn’t have pom molasses, but I do have concentrated pom juice at all times to add a small amount to my smoothie. I used 4 TB and it gave it a nice flavor. I used 5 cups of water and that seems just about right. I slow-cooked for about 8.5 hours hoping to cook the lentils a little more. I would normally have stopped at 8 hrs. Maybe soaking them beforehand might help. I didn’t have the mesquite or hickory seasoning so I left that out. I used a little extra cumin. I wanted to let you know that it cooks up wonderfully in the crock-pot, just like a regular stew. I loved the Thai Tofu Salad so much that I thought I’d try the crock pot on this one too! Glad I did. I’ll be making this often!!! Thanks for your delicious recipes as always. The chile peppers are just slender hot red peppers; you can see one in the photo. I haven’t tried using a slow cooker, but I can’t see any reason why it wouldn’t work. I made your Creole Black eyed Peas for New Years and really enjoyed it. This sounds delicious and I’d like to try it also. Will regular grocery stores carry the seitan? and where could I find pomegranate molasses? Thank you very much, I look forward to trying more of your recipes. I’m so glad you enjoyed the black-eyed peas. For this dish, you’ll be making the seitan out of wheat gluten, which some grocery stores carry but not all. You’ll be more likely to find it at natural food stores like Whole Foods. For the pomegranate molasses, you may need to look in a Middle Eastern store, but try checking the international section of a large grocery store. Sometimes I can find it there. I have never posted on a blog of any kind before, but I am so grateful for this recipe that I felt it would be wrong not to give you a big, public ‘thank you’! I have made this stew many times now, and it always gets rave reviews. I do use a bit of oil when sauteeing the onion. And I double the “seasoning blend”. Finally, for gluten-free friends, I have used deep-fried tofu instead of seitan. (There is a Korean grocery store on my block that sells frozen pre-fried tofu. This is of course not consistent with a ‘fat free’ diet, but it tastes great and is a fine gluten-free alternative). I’ve never tried subbing in chickpeas for the setian, but I bet that would also work. Thanks for your wonderful website, and for this fantastic recipe! even my extremely picky eater ate this. Helps tht she likes seitan to begin with. pomegranate molasses? can I use regular molasses? I wouldn’t. I think the flavor would be overpowering. Try 1 tablespoon of lemon juice and 1 tablespoon of some other sweetener such as sugar, agave, or maple syrup. This was super yummy! I made the gf version with chickpeas. Yum! I made this last weekend, and it was SO good. I’m always a little hesitant when recipes call for a lot of cinnamon/clove type spices, ’cause it’s really hard for me to make the brain shift to those not necessarily being associated with sweet flavors and I have to be in the mood for something like that, but I went for it (mostly because I’d bought a bottle of pomegranate molasses and it was taunting me from the pantry). I did leave out the cloves, but followed the rest of the recipe as written. Just, WOW. I secreted away what little leftovers there were and snuck them in my lunch bag the next day. Will definitely be making this one again! This was SO very delicious, Susan! My stomach is very, very pleased and thankful. I had an eggplant that was getting old and I had been looking here and yonder trying to find something I’d like to do with it. I stumbled upon this recipe while looking for something else, and I am so happy I did! Simply delicious. I used green split peas and 1.5 times the spices, I pre-baked the seitan, which I made with peanut butter, I added a little more than .5 lb. of cut green beans (for a touch of green), and as I didn’t have the molasses, nor even a lemon, I sub’d it with lime juice and sugar, as you suggested above. So, I’ve made this several times as written (it’s my favorite way to eat eggplant, if there is such a thing), and LOVE it. We’re back to the ETL 6-week basics for the time being, so decided to try it with chick peas. It’s still fantastic! I doubled the split peas, used 10 cups of water, used more rounded measurements of the seasonings, and put the eggplant in at the beginning with the peas in the Fagor for the 16 minutes (I wanted it to disintegrate as much as possible). Quick-released the pressure, threw in a can of chick peas and some mushrooms I’d previously cooked and frozen, and let it cook down for maybe 20 minutes or so. It was pretty thin, so might scale back the water a little next time, but this DOES work without the seitan, for sure! I can’t wait to try this delicious sounding recipe. The spice blend sounds so good I bought a jar of it. Since I don’t need to make the blend, can you please tell me about how much I need to add of the baharat? Many thanks for you wonderful recipes! If I were you, I would add the spice blend to taste. Maybe start with a teaspoon to see how strong it is and then go from there. My spice blend makes about 4 teaspoons worth, but the kind you bought may be spicier, so I wouldn’t want you to overdo it. Thank you! Looking forward to making it once the weather cools down. Threw this together because I just happened to have all of these ingredients on hand. Turned out nice for the most part! I had to adjust the seasoning to make it stronger, and I would highly recommend baking the seitan until firm. It turned out way to soft and gummy in my stew. 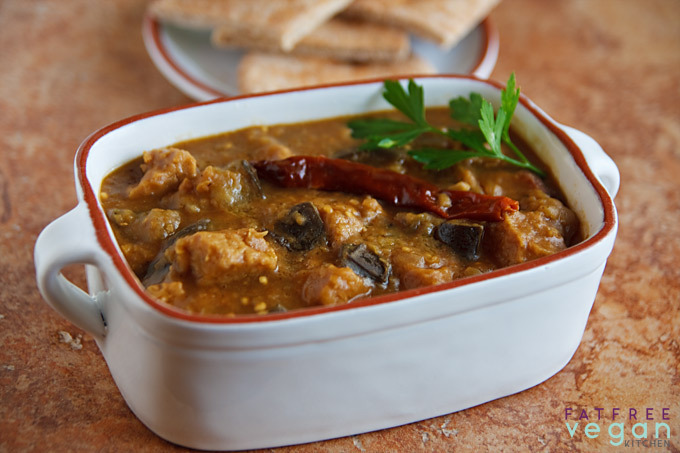 Once you as the seitan and eggplant, how long should you cook if you are using a pressure cooker?